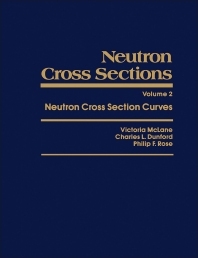 Neutron Cross Sections, Volume 2: Neutron Cross Section Curves presents data for total reaction cross sections and related fission parameters as a function of incident-neutron energy. This book covers energy range from 0.01 eV to 200 MeV to exclude crystalline and magnetic effects for slow neutrons and relativistic effects for high energy neutrons. The data in this volume are grouped into sections corresponding to the element of the target nucleus in the neutron-induced reaction. These sections are ordered in increasing atomic number. Within a section, graphical data are presented for the natural element followed by the isotopes of that element in order of increasing atomic mass. A list of the reaction types is provided at the end of each section. This book also provides graphical section, wherein each graphical page is annotated on the outer edge with a symbol for an element or isotope followed by the list of the cross section data for that element or isotope. The data plotted in the graphical section are tagged by a mnemonic consisting of year, laboratory, and author's last name. This tag can be used to find the corresponding reference on the bibliographic pages.